A Large round pom pom sits at the end of each winding arm, making for a whimsical appearance as single stem balls. The branches bend around in all directions to provide a break to any conventional design. The Boulevard Cypress Pom Pom Topiary is a hardy evergreen which has soft, silver-blue needles that handle shaping very well. As a live topiary, it is easy to care for and only needs to be trimmed a couple of times a year. The Boulevard’s Japanese origin makes it easy to see why this adaptable tree became such a popular topiary tree, and it will make a great accent to any garden. 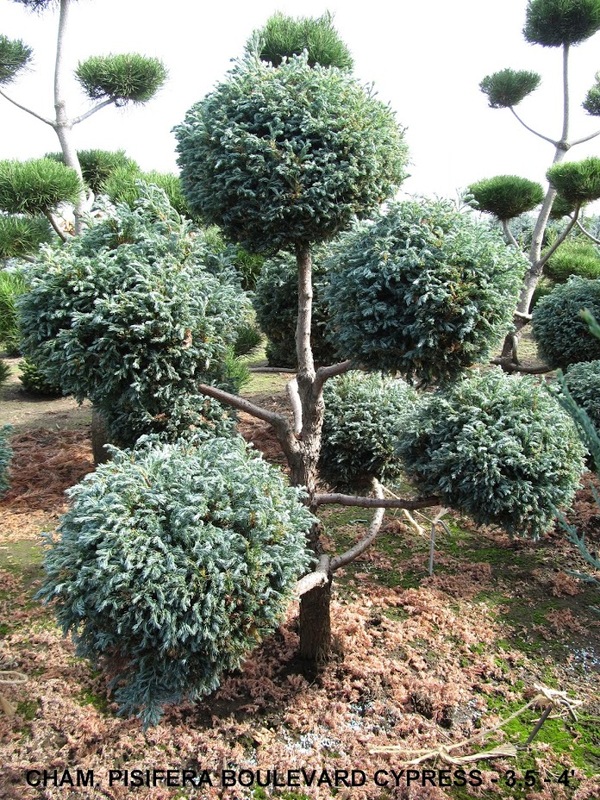 The Boulevard Cypress Pom Pom topiary can tolerate heavy pruning and when the silvery-blue needles get sheared into a pom pom form it creates a very unique looking plant. The silvery-blue foliage becomes purple-tinged in winter and is perfect as an accent plant in a garden or landscape.